When Alanna from Missouri typed the word Colcannon on her keyboard and pressed 'send', little did she know the repurcussions that were soon to be felt in a Victorian terraced house in London. 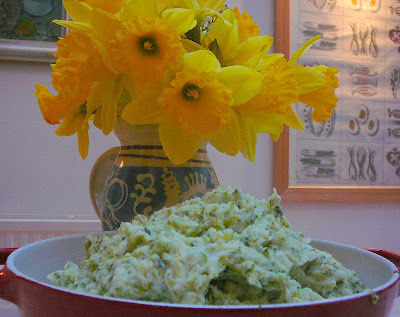 Because Alanna's recipe for Colcannon has made a schoolboy happy. "Tell her right now its heaven." says Freddie who asked me, "Are you sure there really is cabbage in this?" There was a whole tonne of cabbage in this dish ( well not literally) and he loved it. And I didn't even have to add bacon or beef dripping or meat extract to make him like it. It's not even a cake recipe which is the other way to Fred's heart. Heaven? Well my my my. I hear you loud and clear, Freddie, all the way from the middle of America! And may we be co-adventurers? You see, my blog is all about vegetables too. So I am very excited to learn about what you like and don't like. And no matter what, you get "full marks" whenever you try something and give it a fair chance.